﻿There was a time when gentlemen were expected to belong to a men’s club, while ladies joined women’s clubs. In these social strongholds men would smoke cigars and discuss business, yachting, politics and athletics. Women conducted charities, advanced social causes and discussed art and literature. The separation of the sexes seemed quite normal. One such gentlemen’s club was the Racquet and Tennis Club. No stodgy club in which overweight millionaires gulped raw oysters and dozed in wing chairs, the Racquet and Tennis Club attracted wealthy New York men who were serious about their sports. As taller buildings began overshadowing their 1891 clubhouse on 43rd Street, blocking the light into their skylit racquets courts and court-tennis courts, members clamored for a new building. In 1916 the board of managers accepted the offer from multi-millionaire member Robert Goelet to build a clubhouse and lease it to the club. The commission for the new building was given to McKim, Mead and White. By this time Charles McKim and Stanford White had both died and William Mead had retired. Architect W. S. Richardson oversaw the project, which was completed in 1918. 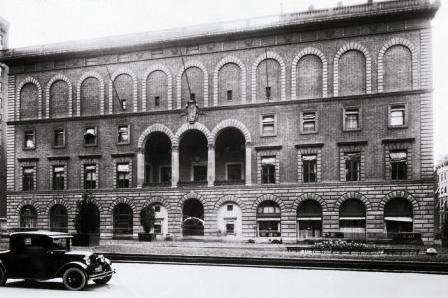 What resulted was an Florentine palazzo of brick and limestone, its height purposely twice the width of Park Avenue. A second floor loggia sat on the rusticated base of the ground floor providing the structure’s single most interesting visual element. Perched above the windowless top floors was a formal balustrade. The cornice frieze was decorated with reliefs of racquets. Four years later polo-playing member Rene LaMontagne hosted a bachelor party. As with all good bachelor parties, the guests enjoyed a few drinks. The problem was that this was during the second year of Prohibition. LaMontagne was arrested and charged with selling 316 cases of scotch, 500 cases of gin, 16,000 gallons of rye and 9,000 gallons of wine. It was apparently a good party. LaMontagne was jailed for four months and the 60-foot long antique bar which had stood in the 43rd Street club was removed. In the 1970s when New York real estate giants the Fisher Brothers planned their 44-story Park Avenue Plaza office tower behind the clubhouse they met with the club to negotiate air rights. The negotiations ground to a halt when a price could not be agreed upon. 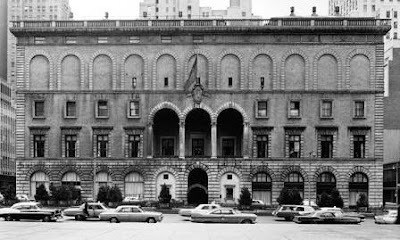 The Racquet and Tennis Club, therefore, announced their plans to build a hotel over their building – effectively blocking all views and light towards Park Avenue to the Fischer's building. A $5 million deal was signed for the air rights. In 1987 the club’s men-only rule came under attack. Court tennis player Evelyn David lived “a few blocks” from the club and was preparing for the women’s world championships in England. Every weekend she would board a bus and travel to Tuxedo, New York; the next closest court tennis courts (there are only nine court tennis clubs in America). David requested use of the Park Avenue courts. When turned down she offered to practice early in the mornings before members arrived. The Club stood firm. In the end Evelyn David continued to ride the bus and today there are still no female members. Women are admitted into the club only for special affairs and then only when accompanied by members. Today, like its 43rd Street predecessor, the Racquet and Tennis Club’s five-story Italian palazzo is falling under the shadows of glass and steel commercial towers as the atmosphere of Park Avenue continues to change. I want to improve and be an arounder (a bit more offense than defense, let's say 60% of offense and 40% of defense), does this racket suit me? Thanks and more power to you.